I am fascinated with minimalism and all the dimensions it can take on. It doesn’t just have to be about having little possessions, but instead about a life of happiness, contentment and purpose. My first minimalist post was all about this. 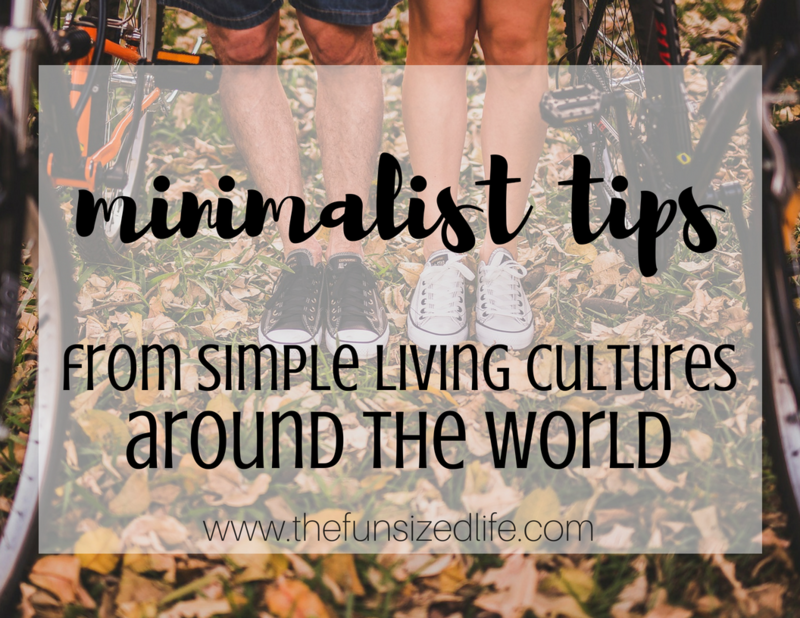 After watching documentaries and reading stories, I’ve decided to share some minimalist tips from simple living cultures around the world. There is so much we can learn and benefit from how other people do things and minimalism is no exception. So if you’re craving a little minimalist inspiration, read on and hopefully you’ll get some great new simple living ideas you can incorporate at home. There is a huge movement toward minimalism in Japan right now which is great because from what I hear, they have drifted far from their roots in a lot of ways. While the island of Okinawa has some of the most simple living and oldest people in the world, places like Tokyo are overrun with work-a-holics who are literally working themselves to an early death. They even have a word for it: Karoshi. These were my driving forces behind decluttering and downsizing our family. Perhaps that’s because I’m a quarter Japanese?!? Many people from around the world are taking the time to let go of obligations in order to travel. After living out of a backpack for a long period of time, many people are coming home to realize just how much stuff they thought they needed but really didn’t. This is an idea I recommend on how to downsize without moving. Practicing how much you can live without is a great way to realize just how much excess we have in our lives. You could try the 333 closet downsize challenge as well, if you don’t feel like shoving all your clothing into a backpack. This sounds like I want people to live in tents. That’s not what I mean at all. What I mean is, location, location, location! More people are choosing homes out of the suburbs and cities and right into the heart of nature. In beautiful countries like Canada and Finland, there is so much beauty to be seen outdoors, that creating an attractive, clutter-filled home indoors seems pointless. If you love soaking up sunlight and nature, why not get more of if by having a smaller home that encourages you to get out and experience all that the outdoors has to offer? I watched a documentary about how happy people are in the Netherlands and how communal living is a common thing. People live together with other families, they make dinners together –and take turns making it! This idea has grown so much that a group of families actually got together to have an architect design their own multi-family house! Each family has their own living quarters but share a few spots with the rest of the families, including a beautiful, 4,200 square foot garden! See the entire home. It becomes so easy to separate ourselves from our friends, family, and neighbors when we have other “stuff” to tend to. Why not knock down those walls and get cozier with the people you care about? Studies show that people do better with the community surrounding them. Maybe you don’t have to build a house with all your friends, but don’t let your possessions get in the way of building and maintaining relationships! I’m willing to bet that by now you have heard the word, “hygge.” Maybe you haven’t. If not, welcome to the latest minimalist (kind of) trend from Denmark. Because Denmark has long, cold winters (I can relate over here in Minnesota) they try to create a hygge home. I’m not even sure if I’m using that correctly in a sentence but you know what I mean. The basic idea of hygge is to have a cozy, comfortable home that nourishes your soul. It’s about togetherness, self-care and of course, candlelight. Fun fact: Denmark goes through more candles per year than anywhere else in the world. Just imagine a dark home with cozy blankets, candles lit, and snuggling up with coffee and a piece of cake while chatting the night away with people you love. That’s hygge. It’s simple. It’s all things wonderful. In America, I think too many families separate into their own rooms to watch their own shows or play video games. Smartphones are taking over. All this stuff gets in the way. Minimalism should help prevent all these distractions from getting in the way of quality time by yourself or face to face with the people you love the most. In some cases, technology gets in the way. There’s no denying that. However, you can use technology to benefit you on your minimalist journey. For example, my husband still has an entire CD collection shoved under our dresser collecting dust. I parted with mine years ago because…iPhones, that’s why. If I want to listen to a song, it’s right at my fingertips at all times. How amazing. What else can technology help you declutter? Paper — Check out this guide on how to create a paperless home. When I began practicing minimalism my intention was to create a home that was authentic to me. Not a home filled with all the latest trends, but something that felt genuine to who I am and what I love. That’s why our home is filled with antiques from my grandparents, the artwork of our children in frames and Normal Rockwell artwork of course. The Danish people take this to a whole new level and create crisp, clean, high styled homes. Not quite my cup of tea but I do love the idea of investing in high quality, long lasting things in order to create a sleek and stylish space! I used to fill our home with whatever style I bumped into at the local department store. Now I only buy things that speak to my soul and bring a smile to my face. Not many items make the cut either. I’m always sure to purchase with intention and a lot of thought. It’s crazy to think that in England the average home size is around 1,000 square feet. Here in America, people feel like they are suffocating in 2,000 square feet! The idea of a smaller house sounds perfect to me. Once my grandma passed away all I could think about was her house. It was the most “homey” house I had ever been in. There were only 900 finished square feet. The basement was my personal playground and storage for canned veggies from the garden. That’s it. Do you think you could fit your whole life into 1,000 square feet? If you’re single or without children, do you imagine yourselves being comfortable forever in only 1,000 square feet? Most people would say no. Minimalism would have you consider that the smaller the home, the more warmth there is to be found. One Japanese woman found herself searching catalogs looking for the perfect items to help decorate and fill her home. Then she decided maybe she would make her space work by clearing stuff out rather than bringing new things in. Personally, we have hardly any photos on our walls. I have zero pictures of my kids hung up. Believe me, I know how terrible that sounds but the truth is, having frames everywhere causes me anxiety and makes everything feel smaller and not in a good way. I do have their artwork on the walls as well as artwork from my grandma. You don’t have to go to my extreme by any means but do you have shelves you’ve been trying to fill up with cute decorations? Why not just get rid of the shelf? Problem solved, money saved. No one likes dusting shelves anyway! When you start keeping a clean, clear house, why not carry this concept out into the world around you? Finland recently won the title of “Happiest Place to Live” and a big part of it was because of their strong desire to care for the environment. Clearing clutter inside is a great start, but the environment needs the same kind of treatment. Maybe consider composting or becoming aplastic-freee home? Allow minimalism to let you become more intentional in every area of your life. People in the Netherlands bike constantly. This isn’t exclusive to their culture by any means. More and more countries are taking notice and choosing to walk and bike instead of drive. Many places have to consider their natural disasters. Again, in Japan, after experience a huge loss of life after a tsunami, many people took notice of the fact that many people were killed because of objects in their homes falling on them. This isn’t a worry many people have to face but it’s still smart to consider. If you were to experience a fire or a natural disaster, would your possessions stand in the way of you and your safety? Too much clutter to get out safely? Not only does being a minimalist look different in different cultures, it looks different from person to person. There is no wrong way to do minimalism. My hope is that you can take some of these ideas and inspirations from other minimalists around the world and apply them to your life. Any other ideas? What does simple living look like where you are?